It’s spooky how quickly it comes around but it’s here – Halloween! We are pleased to announce an October giveaway for a chance to win a trick or a treat in time for the Halloween celebrations. One of our most popular ranges is the wonderful Spectrum Collection and we love the collection of stylishly playful rugs for every room in the house. We are passionate about bringing fashion to your floors and the Spectrum rug collection is created to inspire you to bring beautiful prints, patterns and colours into your interior scheme! From traditional weaves to bold, contemporary prints, we adore the diversity and quality of the range. Decorating a room with a rug opens up a world of possibilities. For a little Halloween Treat, and to offer you the chance to update your interior. We’ve got an extravagant Spectrum Limbo Rug (160x230cm) worth £119.95 to give away to one lucky winner! Shout loud with this bold trellis design. With a gorgeous trellis pattern, this rug will transform your floor into a showstopper and the 100% polypropylene pile feels wonderful underfoot! Also newly added designs to bring new colours and freshness to the collection, and your home. Entry into this contest will require you to fill out your name and your email address. Enter the contest by filling in the form below. The giveaway is running for the entire month of October and ends October 31st, 2017 (Halloween) at 4pm. When the time expires, we’ll choose the winner, email them directly, and announce them across all our social media pages. 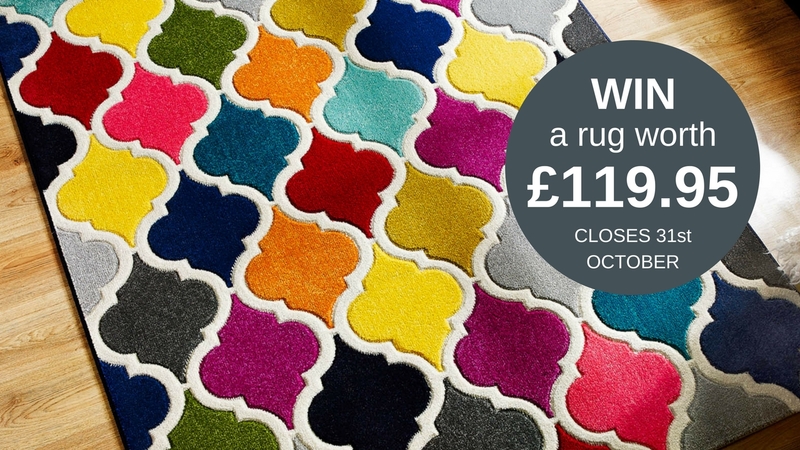 To clarify, once you have filled in your name and email address, you’ll be entered into the Halloween rug competition. All you need to do next is just wait for the announcement of the winner. The winner will be chosen at random using a third-party application called Raffle Copter. Also, stay updated with any of our future competitions or giveaways by following us on our social media platforms Facebook, Twitter and Pinterest. 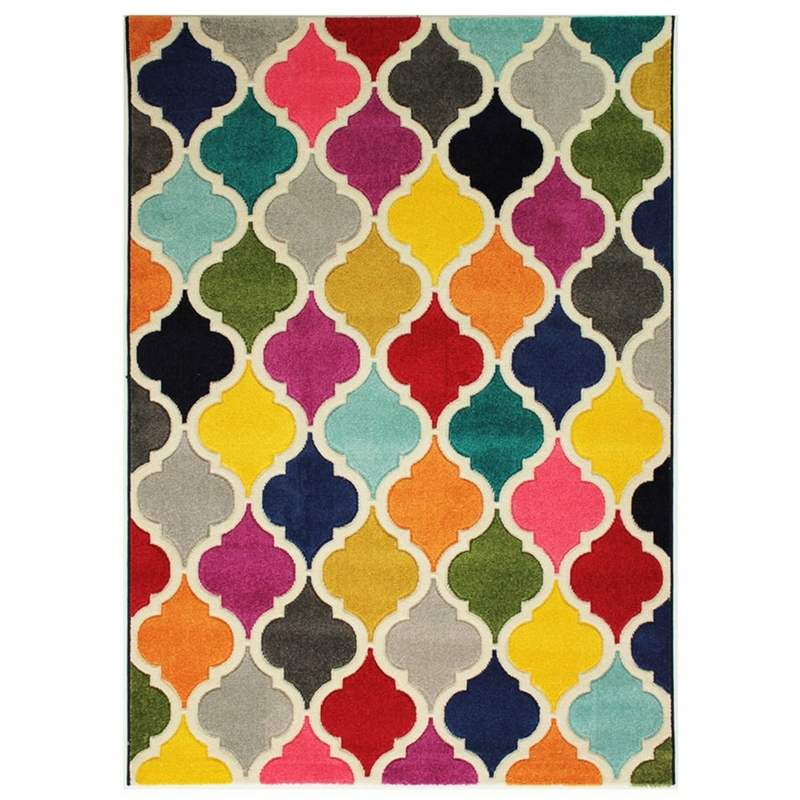 Where in your home would you place this bright rug? Let us know and leave a comment below! It would go in my lounge with my new wooden floor. This would certainly brighten things up !!! The rugs are fantastic, colours are beautiful. It would go in my lounge, it would look fabulous. It will take pride of place in my lounge for visitors and friends to admire!!! love the vivid bright colours. On my bedroom floor to brighten up my mornings and make it easier to get out of bed. To brighten up my lounge especially in these dark and gloomy months. The rug would be in the hallway. A bright and warm welcome for family and friends. I would love a rug like this! I would put this rug in my front room in front of our log burner. It is amazing absolutely love the design and colours. I would like to win this rug for my grandchildren,s playroom. This would look amazing in my front room! These rugs are stunning. I would love to win one. Beautiful…love it. I’d put it in my hallway. Brighten your spirit even on the dullest day! Definitely my lounge on constant display! They are gorgeous! It’s a very colourful and a very bright rug. I love it. I would place this colorful rug in my large hallway – which will lift anyone’s mood as they enter the house and leave, it gives a natural warmth in winter, welcomes spring, is exotic in summer, and waits patienly in Autumn for cosy night in!! The limbo rug would look great in our study! In my dining room in front of the woodburner, it would give some lovely colour on a wintry evening. 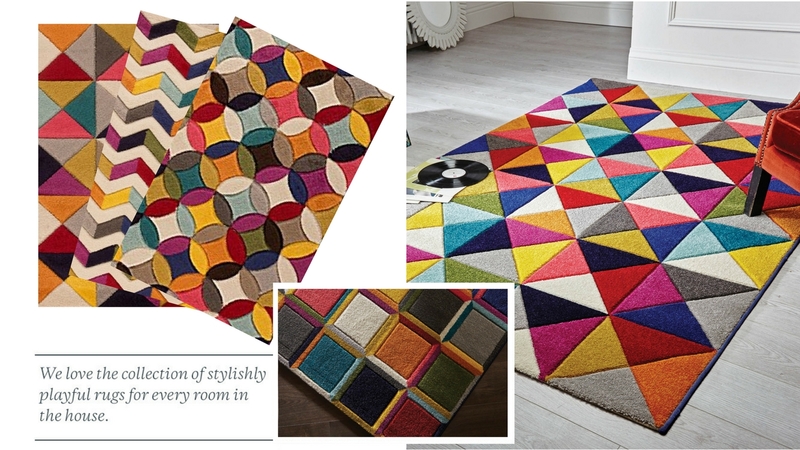 I love the colourful rugs and would place one on my wooden hall floor. It would be a wonderfully cheerfull warm welcome for our family and guests. In my hall way so everyone could see the bright colours and designs, when they enter my house. This is a beautiful tug.the colours simply sing. I would give this pride of place in my living room. I own a spectrum mambo rug. Are you the designer of that range? If so you have enlightened me a women of 71 to broaden my horizons and use colour. My usual colour scheme was boring and predictable. Bland neutral colours were used in every room. Then I saw the spectrum range and I fell in love with the heart lifting colours which brought my bland boring room to life. I have just the place for the spectrum limbo in my living room in front of the fireplace. My friends would be jealous and I would enjoy their response. At my age not many things give me as much pleasure !!! I own a spectrum mambo rug from rug seller. Are you the designer of the spectrum range? If so your designs have enlightened me a women of 71yrs to broaden my horizon and enjoy colour. My usual colour scheme was bland and boring. Neutral colours in every room. Then I fell in love with the spectrum range which brought life and colour to my boring room. I have just the place for the spectrum limbo rug in my living room in front of my fire place. I will enjoy people’s response when they see my beautiful rug. I would love this rug to brighten up my living room. I would place this gorgeous rug centrally in my living room where it would have maximum impact! I think this rug would look great in my grandson’s bedroom. Dining room. To provide a talking point over meals and brighten up the room. I want 2 runners for my main hallway as I live in a Bungalow and want something bright as you enter. I would actually have a home for this rug in any room in my home!! So vibrant and reflecting the colours in our lounge and bedrooms. It would have a very good home if it came to live with me! 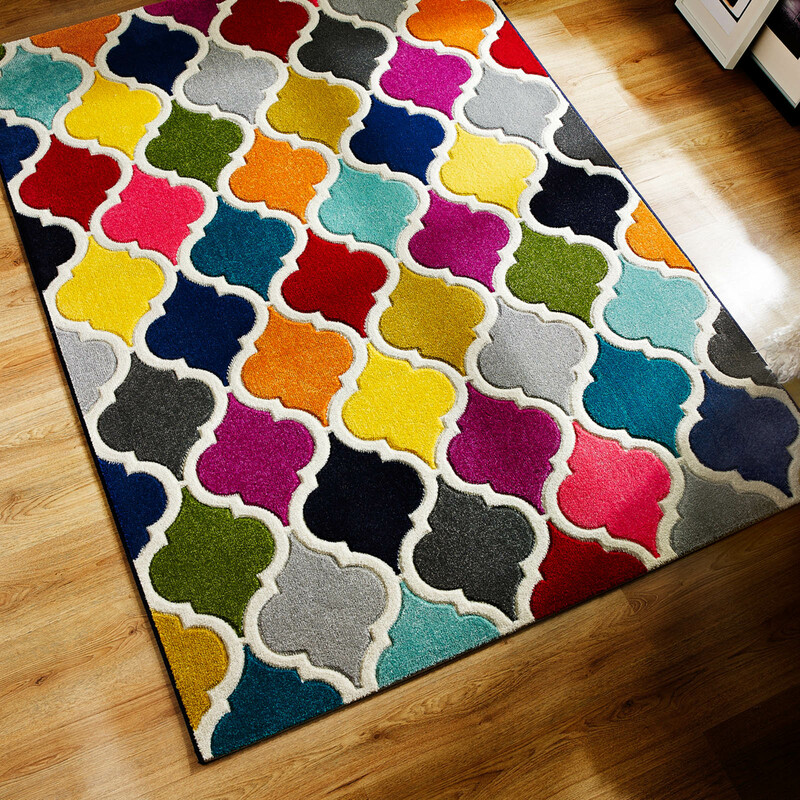 … what a lovely bright rug … this would lift my spirits daily …. I do hope I win but if I don’t I hope it lifts the spirits of the winner. It would certainly brighten up my dreary bedroom. Fab giveaway would love to be your lucky winner. About to move into our new house. This rug would look great anywhere in the house. I would put it in my hallway. It would give visitors a welcome lift in spirit. I Would put it in my granddaughters bedroom; I think she would love it. I would put this beautiful rug in the heart of our home, our family ‘snug’ room….it’s where we hang out and spend rainy afternoons and cold winter nights. I would put it in my hallway to brighten it up and make guests feel amazed and welcome! If I win I will put this is my newly decorated spare/chill out room – it would be perfect for it! I would put this rug on my lounge floor where everyone could see it and sink into its loveliness. I have so many of these colours in my lounge the rug would complete the look, it’s gorgeous. In my lounge to perk it up! my hall, lovely bright entrance! Probably the living room. Love the colours, really stands out. I will keep rug till Christmas, my tree is always a surprise and this will add to the surprise this year. We would put it in the Hallway to make the entrance warm and welcoming. It would be in our living room in front of our gas fire. It’s beautiful bright colours would help us feel lovely and cosy on the winter nights. Love it! On front of my bright yellow reading chair in the front lounge ! This would be a exciting and vibrant edition to our reading nook under our staircase, it would be perfect! In the living room where I spend most time.What a beautiful rug. In the hallway. A lovely bright and cheery welcome for my guests. 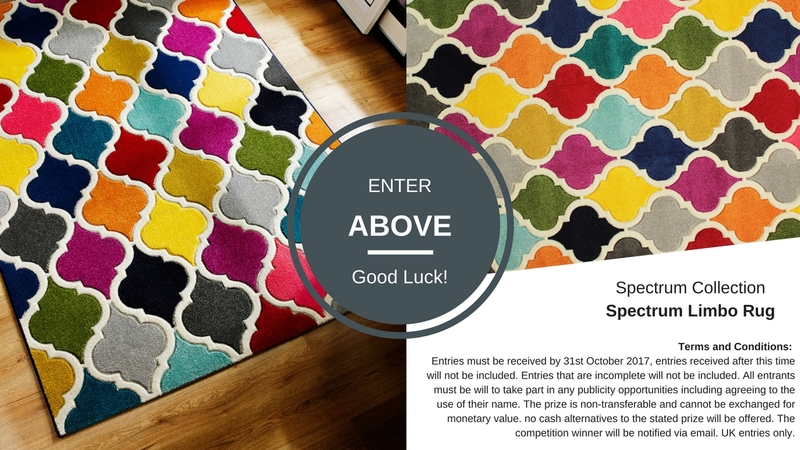 I would love to win this beautiful rug – it is perfect for brightening up my lounge! I would love this for my living room, it’s definitely in need of an update! Stunning, vibrant rug. Perfect for any room, but I’d have in my lounge. I would put it in my living room so it brightens up my day. Anywhere it would be seen, it’s just too cheerful to be hidden away! My bedroom as it’s my haven away from all the stress. I only have items in there that make me smile and this gorgeous colourful rug would be a perfect centrepiece. I’d put it in my windowless, tiled hallway to brighten it up and give some warmth underfoot – such a beautiful rug I’d have no end of colour choices the next time I decorate the walls! Centre Piece! in the living room. Shown of to be admired! I LOVE Bright! I love Unique! & i love Quality!!! This Limbo rug would look fabulous in my living room. The colours are amazing and it would certainly brighten it up. Love how vibrant the colours are. This would look fabulous in my lounge. This I should just the bit of colour my lounge is craving ! Beautiful! I would put this in my home office, that is where I spend most of my time, it’s vibrant colours will be sure to keep my inspiration flowing.